Honey Cuisine Sushi and BBQ is just a stone’s throw from Sonoma State University. Since the restaurant opened May 2008, its patron mix has been 50-50 college students and locals, according to restaurant owner Hyun Kim. Most of the diners on the two nights I visited didn’t appear to be of Asian descent. Kim said they’ve been blessed with busyness from day one, even though they opened just after the start of the recent U.S. economic recession in December 2007. The restaurant is a newcomer to the sparsely served north San Francisco Bay area Korean food scene. Two Korean restaurants in Santa Rosa — one focusing on barbecue and the other on fusion fare — opened and closed in the past decade. Traditional-leaning Bear Korean Restaurant in the Sonoma County accordion capital of Cotati also opened in that timeframe and remains open under new ownership. Honey Cuisine has traditional Korean selections at the back of the menu. But as sushi in the name suggests, much of the menu features a number of Japanese dishes, mainly sashimi, sushi, tempura and intriguing mixtures of the three, including baked sushi. So Honey Cuisine deserved at least two visits to sample the spectrum. On our first trip, we focused on Korean standards. My husband ordered 돌솥 비빔밥 dolsot bibimbap with chicken ($10.95). 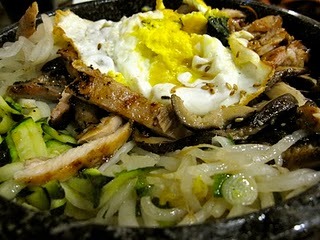 The hot stone bowl featured a mix of mushrooms, carrots, onions, zucchini, spinach, grilled chicken and sunnyside-up egg. Adding a familiar Korean restaurant touch, a squeeze bottle of 고추장 gochujang on the table allowed for do-it-yourself spiciness. I ordered barbecued chicken ($12.95). It included some zucchini, mushroom, carrot and jalapeno peppers mixed into the smoky, spicy sauce. Barbecued menu items, which include beef and pork, come with kimchi and steamed rice. This was the first time I tasted Korean barbecued chicken with a strong smoke flavor. The use of smoke as a flavor ingredient is commonly thought of as an European-American trademark. Honey Cuisine does not overwhelm customers with the typical Korean practice of covering the table with small-dish appetizers, called 반찬 banchan in Korean. Even the classic spicy cabbage kimchi (배추김치 baechu kimchi) is not king in this Korean restaurant. Our server asked me, “Do you want to try some kimchi?” Of course, I did. Honey Cuisine’s baechu kimchi had the balance of sweet, spicy, sour and salty one expects from this Korean staple. I also ordered seaweed salad ($4.95). The seaweed was thinly julienned and piled on a bed of thinly julienned, slightly pickled daikon radish and drizzled with sesame oil dressing. One the second visit, I had to try something from their extensive sushi and sashimi menu. The sushi that caught my eye was called 911 Sushi ($9.95). This spicy sushi featured a spicy tuna center rolled in 김 kim, or the rolled seaweed wrap the Japanese call nori. A layer of rice circumferenced the kim and tuna core. Avocado covered the top along with a playful sunbeam-like painting across the plate with a spicy, creamy sauce and a savory oil. The spiciness slowly sneaked up on me, causing a light sweat and a little drip from your nose. It’s not “I dare you to eat this” spicy. My husband ordered chicken 잡채 japchae ($9.95), which seemed to be a fusion dish of japchae and chicken teriyaki. The dish arrived on a plate had white rice on one-third, and on the rest was a mound of chicken strips grilled in a teriyaki-style marinade as well as lightly steamed and stir-fried onions, zucchini, broccoli and carrot. 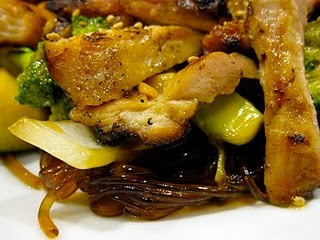 Peeking out from underneath the chicken and veggies were cellophane noodles, appearing dark golden brown from the sauce. Japchae can be a bellwether for attention to detail in Korean cuisine because of the subtle balance in the noodle sauce among pungent sesame oil, salty soy sauce, strong garlic, zesty black pepper and sometimes a touch of sweetness. Honey Cuisine’s japchae sauce tasted heavier on soy sauce and light on sesame oil, garlic and pepper. I’ve had successes and failures in achieving that balance when making the dish myself. And even Bear Korean’s japchae has been soy sauce–heavy at times. The noodles were left uncut — i.e., more fork-friendly than chopstick-friendly — and had a more rubbery texture than we’ve tasted to date. The appearance of food-only scissors when food is served can be off-putting to foreigners visiting Korea, but it is a hallmark of hospitality to serve food that one can eat with chopsticks and without cutting. Yet the ethnic mix of Honey Cuisine’s clientele mentioned earlier explains the restaurant’s place setting with fork, steak knife and bamboo chopsticks, rather than the traditional Korean setting of chopsticks and spoon. On a busy night (Friday and Saturday, especially) exercise some patience in getting your meal, and expect a 30 minute wait for your meal. The restaurant seats about 40 people inside and accommodates small parties. Hours: Monday–Saturday, 11 a.m. – 9 p.m. Closed Sundays. Previous“Earth Is Gone” is Back!